Today we had a server outage which lasted for an hour. We are currently investigating the issue. If you have any questions send us a reply or contact us on our contact page. Following the brute force attacks to our site in Oct/Nov 2014 we started working on securing our site. We have been experiencing a problem with our streams 50s/60s & 70s/80s/90s streams including our website. We have been victims of several Brute Force Attacks on this (WordPress) Site. These incidents of attacks causing High Loads on our server creating server downtime.We have been working on the problem & are trying to resolve the issue ASAP. We now seem to have solved the Brute Force Attacks on this Site and are confident that we have solved the issues. If you have any questions send us a reply or contact us on our contact page. Our music content can be updated quickly & easily without having any coding knowledge thanks to our reliabilable & flexible software on our servers. Our website also created using some flexible layout builder software. Our music is controlled by responsive software that ensures our radio station is responsive on the internet at all times. All our music content or playlists are software controlled on our servers. We reduced our downtime time by building this station on a reliable server hardware framework. Despite the frequent introduction by Microsoft of newer versions of its Windows operating system over the years, many business and home PC users are still using Windows XP, which was replaced back in 2007. However, Microsoft finally ceased support for XP on April 8th 2014 and therefore no longer issues updates, security patches, bug fixes and Microsoft Security Essentials for the operating system. As no security updates are issued, your PC running Windows XP is now highly vulnerable to infection by malware, with criminals being well aware of the vulnerability. To commit identity theft in order to apply for bank accounts, passports and other facilities in your name. To monitor your email and other communications. To make your PC part of a botnet, commonly used to attack corporate or government websites. You probably cannot easily get your XP PC serviced or repaired. 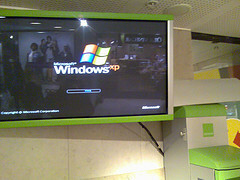 An increasing number of devices and software programs will no longer work with Windows XP. In addition to the above, you risk unauthorised entry to your information systems, leading to your data being accessed or stolen, non-compliance with insurers’ and/or customers’ standards and breaching the Data Protection Act. A decreasing number of independent hardware and software support vendors who will provide services for Windows XP systems. Please note that Microsoft will continue to provide virus warnings for Windows XP until July 14th 2015. Many anti-virus software companies will also continue to update their products to spot malware targeted at the operating system. This still does NOT mean, however, that patches and fixes will be available, and users still need to find a solution. Before you do any of the following, it is very important that you back up the data on your PC and ensure that it can be accessed and recovered on another machine. If your PC is suitable, follow the steps in the tutorial to upgrade. If your PC is unable to run the newer versions of Windows, you will need to buy a new one. Today’s PCs are considerably more powerful, lighter in weight and less expensive than their forbears of ten years ago. If you do buy a new PC and need to transfer what is on your old Windows XP machine across, you can do so using a free migration tool from Microsoft, which can be downloaded by clicking here. If you want to keep your old PC and not upgrade, there are other options such as ‘dual booting’ with one of the many versions of the Linux operating system (Ubuntu, Debian etc..). This would enable you to carry out all online tasks from Linux, and offline tasks like word processing, spreadsheets and photo editing in Windows. This solution does take some time and effort to install, but there are a large number of websites offering advice and guidance. You could also consider changing to a new computer running on a different platform, the one most frequently chosen being the Apple Mac with its OSX operating system, or some of the new generation of netbooks such as those using Google’s Chrome, or Microsoft’s own netbook models. It is worth considering whether you still actually need a desktop or laptop PC when many of the functions you may use it for can be carried out on a tablet, of which there are a wide range of makes and specifications to choose from, ranging from sub-£50 models to those costing many hundreds of pounds. Businesses and enterprises still running Windows XP should urgently adopt a strategy for migration to another platform, which will almost certainly involve considerable investment in new hardware, infrastructure and applications. Small to Medium Sized Businesses: There are many options for small and medium businesses considering moving to a modern PC with the latest productivity and collaboration tools.You should talk to a Microsoft Certified Partner to understand the best options to meet your needs. If your current PC meets the system requirements for Windows 7 or Windows 8, you can buy Windows 7 Professional or Windows 8 Pro from a local retailer or Microsoft Certified Partner. If your PC does not meet system requirements, consider purchasing a new business PC with Windows 8 Pro. Larger Businesses & Enterprises: Microsoft offers large organisations in-depth technical resources, tools, and expert guidance to ease the deployment and management of Windows, Office and Internet Explorer products and technologies. To learn more about migration and deployment programs, pcontact your Microsoft sales representative or Certified Microsoft Partner. You can also learn how to pilot and deploy a modern desktop yourself, from the free Microsoft Deployment Toolkit. Despite the frequent introduction by Microsoft of newer versions of its Windows operating system over the years, many business and home PC users are still using Windows XP, which was replaced back in 2007. However, Microsoft finally ceased support for XP on April 8th 2014 and therefore no longer issues updates, security patches, bug fixes and Microsoft Security Essentials for the operating system. I am the webmaster & stream admin guy here at Endurance Radio, monitoring our streams to ensure the smooth running of all Endurance Radio streams. ← Save Domain Privacy !! We are an internet radio station setup for everyone's listening pleasure covering several decades.